The long-awaited release of Assassin’s Creed Origins is finally upon us, Assassins! So today, we’d like to take a moment to celebrate with our fans and highlight a few things you may want to know before jumping into the swirling sands and sprawling cities of Egypt. One of our primary focuses was in creating a full and complete country – a recreation of an ecosystem befitting a pinnacle of human civilization of the age. That means enhancing every aspect of our living world, from the random folk you meet in a marketplace hawking their wares to the fierce beasts of the desert. Every entity you encounter in the vast and varied environs of Assassin’s Creed Origins has an agenda… an animus, if you will. We are extremely excited for you to immerse yourself in this living world, but it is not without its share of peril! We’ve also completely revamped the combat to help you defend against the potent threats of the Pharaoh’s minions and the myriad creatures you’ll find in the wilderness. You’ll have access to a huge arsenal of gear as well as the ability to upgrade and improve it all. Furthermore, dealing with multiple foes is a bit easier in the new combat system, particularly if you choose a longer weapon like a spear or long axe which gives you extra reach and can strike every enemy within the sweep of your attack! Taking a look at how we handle quests in the Assassin’s Creed series, we have updated our entire approach to quest structure and what that means for interaction in our living world. As you roam the oases and barrens of Egypt, you’ll encounter many who require your aid, but how you prioritize their requests is completely up to you. Bayek is a man known for solving problems and as the Medjay of Siwa he’s both revered by his friends and feared by villains – and solving problems great and small will advance a tapestry of plot threads you can pursue at your sole discretion. 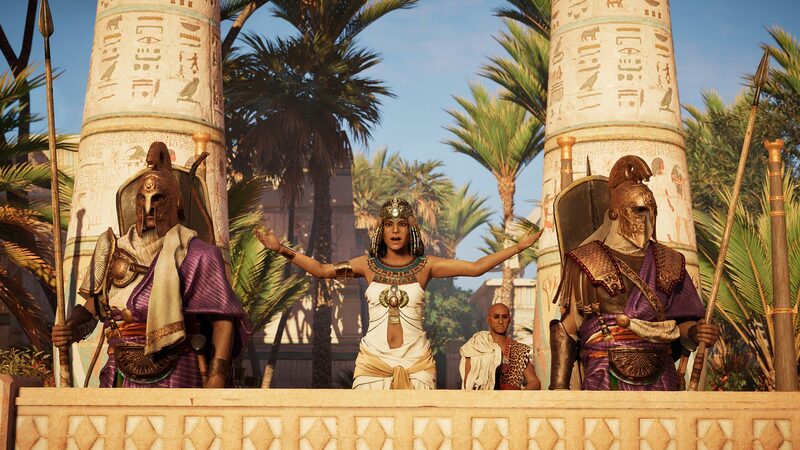 We are very excited for you to begin exploring Egypt with Bayek, but please be sure to take a moment to make sure your gaming device is online so you can download the most recent game updates. Keeping the game up-to-date ensures you the best possible gameplay experience. Should you run into problems, please don’t hesitate to reach out to our Customer Support department at www.support.ubi.com! © 2019 Ubisoft Entertainment. All Rights Reserved. Assassin’s Creed, Ubisoft, and the Ubisoft logo are trademarks of Ubisoft Entertainment in the US and/or other countries. The “PS” Family logo is a registered trademark and “PS4” is a trademark of Sony Interactive Entertainment Inc. Software platform logo (TM and ©) OGA 2019.